I’ve been a subscriber to Kindle Unlimited since last August. Since I also subscribe to Scribd as well as purchase my own books, I like to periodically check and make sure that I am using the service enough to justify the cost. While I do keep track of the books I read on Goodreads, I just don’t always remember to make a note that I have read them through the Kindle Unlimited service. Did you know that there is a way to check which books you’ve read through your Kindle Unlimited subscription? 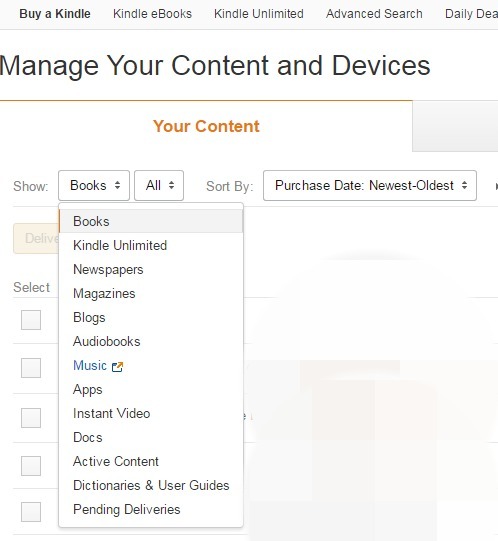 First, log in to Amazon and go to your Account > Manage Your Content and Devices page. Go to the Your Content section of the page. Click the books box to expand the menu and select and click Kindle Unlimited. Note that the box that formerly said all, now says books. The list of books below this section shows you the titles you currently have borrowed from Kindle Unlimited. It also shows the date the books were borrowed. You can sort these items by title, author, and date borrowed. Click on the books box to expand the menu. There are four menu items: books, all, audio books, and returned. Books and all show you the currently borrowed books you have on your device. Audiobooks shows you any audio book versions automatically included with any KU books you have borrowed. 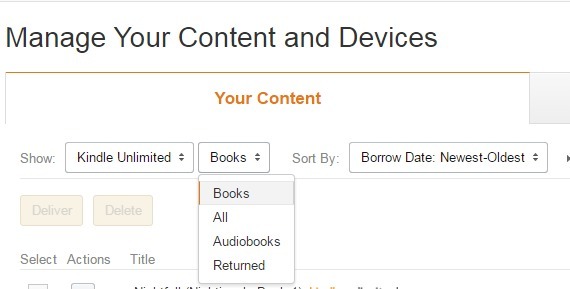 The returned option shows you all the titles you have borrowed and returned from Kindle Unlimited. the returned books can also be sorted by title, author and date borrowed. And that’s it! It’s that easy! 🙂 If you are doing a 30-Day Free Trial of Kindle Unlimited, it is a great way to see if you are using the service enough to make it worthwhile for you. If you have tried the program, please leave a comment and let me know what you think! NOTE: The method described in this article was not working for me briefly in early 2019. You can find an alternative method here. This entry was posted in Did You Know?, Subscription and tagged books read, Kindle Unlimited, returned books, sort by, Subscription. Bookmark the permalink. Good information–thank you! I think I’ll pass it along. Thanks, Carol! 🙂 And thanks for the re-blog! This worked brilliantly and I’ve been wanting for ages to know how to do it, thank you! This is only for Kindle Unlimited books and does not show other books you have removed from your device or books that you read through Prime Reading or the KIndle Owners Lending Library (KOLL). Could you be confusing them with KU titles? There should be a much more obvious way to flag a title that you’ve already read. I read so many book off KU that I have over 9 pages of “returned” books. It would seem to make more user sense to have a flag popup if you request a book that you may have previously downloaded. There should be an easy way to remove books that have been read. Why isn’t there an option to select from the ‘Manage your Contents and Devices’ section? And why do I have to pay to speak to an ‘Expert’ to get an answer to this? I’m not paying $52 NZD for an answer that should readily available in the ‘help’. Jessie, thanks for this info. I will update the article to add this. I would suggest sending an email to kindle-feedback@amazon.com and ask for the data to remain for people who cancel and restart their subscriptions. While I realize that Amazon has a vested interest in wanting people to stay subscribed, if they can keep notes from library book loans after you’ve returned them, they should be able to keep a list of books you read while a KU subscriber. Since KU is no longer available in prepaid blocks and is now only available monthly, A lot more people may be repeatedly starting and stopping their subscriptions.